Having considered all the advice and recommendations I've received. I have decided to make a proper e-book of the Investment Guide I promised you when you subscribed to my blog. It's also expanded and edited. I'm sure you'll enjoy reading it, even though you might be familiar with the valuable information I shared in it. 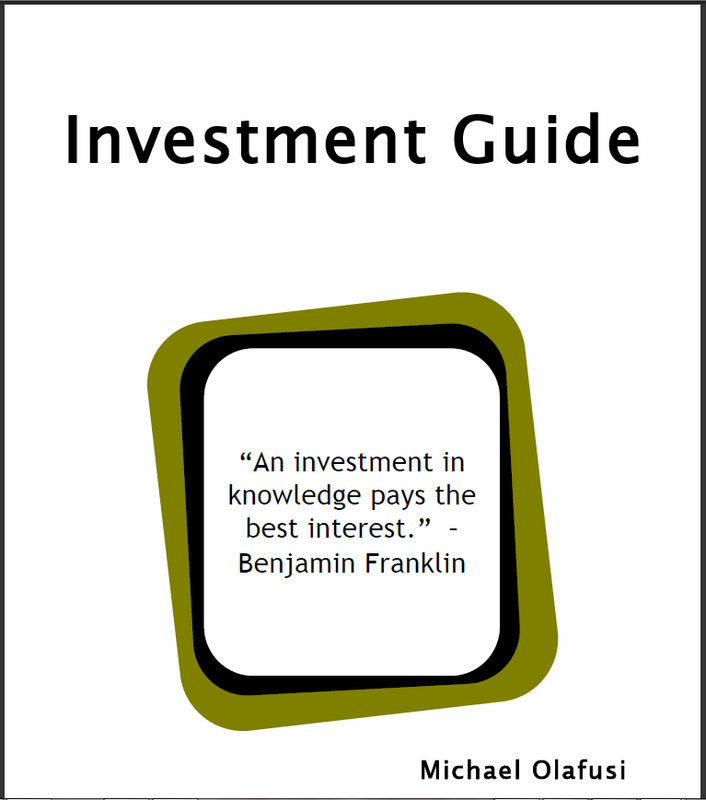 You can download the Investment Guide here. Most of us find the finance and investment world hard to make sense of. We would rather just work hard, earn a respectable income and give someone else (or investment firm) to invest it on our behalves. There is nothing wrong in doing that, well, on the surface. The real trouble in doing that is the underlying assumptions – that you will find a trustworthy and high grade investment manager and that you will never fall into any financial crisis. Sincerely, I would rather cross a road with my eyes closed than take that risk. And since I do not intend to cross the road with my eyes closed, I have taken great pains to equip myself with all the finance and investment knowledge I need. And that knowledge is what I have condensed into this Investment Guide. Best of all, I have made it easy to understand. You don’t need to have any special or background knowledge. All you need to understand everything in this guide is to read this in a calm place and maybe print it out, to easily mark areas that interest you. Why you need to Invest? Investing is not just about wealth generation – making your money work hard for you as you did for it. Investing is also about wealth preservation – making sure that the N1 million you have now will have the same purchasing power 2 or 5 years from now. If you put all your money in a savings account, the interest you will get on it is not going to insulate you from the damaging effect inflation will have on your life savings. As the price of things keep going up and cost of living increases, the N10 million you have in a bank will not be able buy you much in 10 years’ time, the value will have been eroded by inflation. So you really have no option than to make sound investment decisions now. I work terribly hard every day and deny myself a lot to set aside some of my income. I will cry if I discover that the N20 million naira I have saved over my working life is just worth N5 million naira in today’s value. And that is the what inflation does to money kept in a savings account. The house you can buy with the N20 million naira today will be selling for N40 million naira in 10 years, while your savings account will be reading N20.5 million. And that’s if you’re lucky to find a savings account with 3.6% interest rate. Most are 2%. Don't forget to download the Investment Guide here. Hello Micheal! Thanks a lot for this post. I read it a long time ago. I was looking to share the investment guide with someone but it seems the link is now unavailable. Can you please help? Thanks for the heads-up. Will go check what the issue is with the link and fix.